The TCF2019 Theme is Cyber Security. Keynote by Tony Sager. Tony is a Senior Vice President and Chief Evangelist for CIS (The Center for Internet Security). He leads the development of the CIS Controls, a worldwide consensus project to find and support technical best practices in cybersecurity. Tony also serves as the Director of the SANS Innovation Center, a subsidiary of The SANS Institute. In addition a featured presentation on “The State of Cyber Crime in New Jersey” will be delivered by the NJ Department of Homeland Security Cyber Team! The State of Cyber Crime in New Jersey by NJ Department of Homeland Security Cyber Team! Mystabar – a new adventure game that can be played by anyone attending TCF using a smartphone, tablet or laptop. 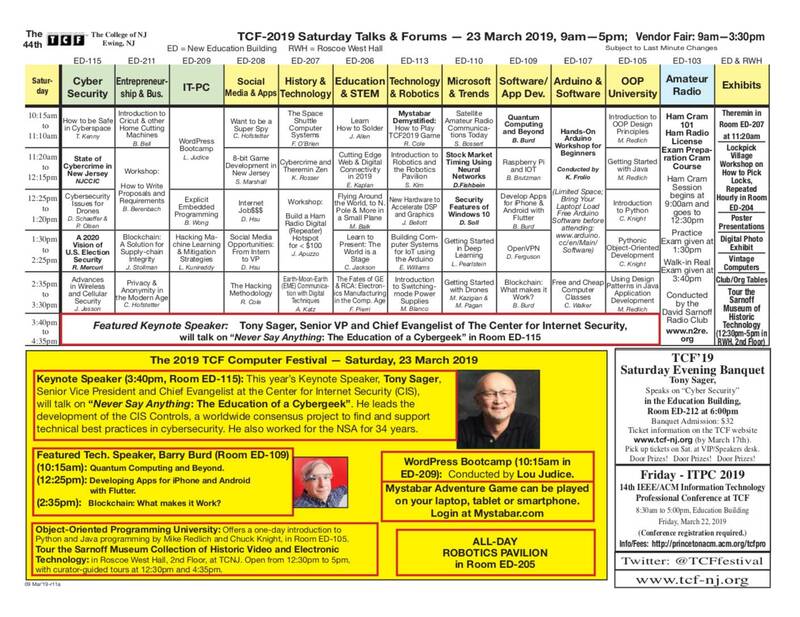 A full day of presentations on IT professional topics, a continuation of ITPC from Friday, 22 March 2019, open to all TCF attendees. Get an Amateur Radio License in a day – Ham Cram & Testing led by the David Sarnoff Radio Club. Talks on STEM and education (see also information on ISEC ’19, to be held on 16 March 2019 at Princeton University). 50+ talks and workshops, special exhibits/demonstrations and more! Check back for the full program, coming soon! Food vendor onsite for breakfast/lunch and free wifi.